RR won the toss and elected to bowl first. Even Lewis and Surya Kumar Yadav started the inning. Both players played very well and scored 51/0 in the first powerplay. S K Yadav(38), Even Lewis (60 of 42, 4 4s, 4 6s), Hardik Pandya (36 of 21, 3 4s and 2 6s). MI 168/6 in 20 overs. Archer and Stocks got 2-2 wickets. Dhawal Kulkarni and Ibadat got 1-1 wicket. Jaspreet Bumrah got the 1st wicket of Darcy Short(4), in 1st over of inning. Jos Buttler played a great inning of 94 not out and achieved RR to win in 18 over. RR 171/3 in 18 overs. 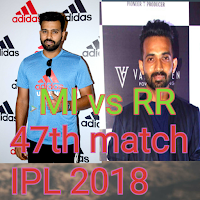 RR won the match by 7 wickets. CSK qualified by this win of Rajasthan Royals.